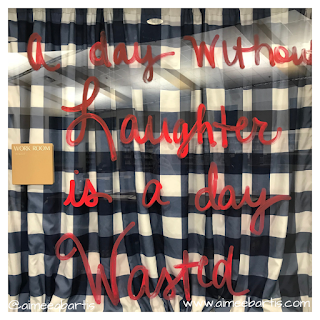 I loved it so much that I painted it on a window at the library as soon as I got to work this morning. I think I laugh every day. Honestly, I can't remember. So many things happen in a day, some things I remember, others pass me by. There's just too much going on for it all to stick. I do work hard at happiness. I surround myself with things that make me smile. I try very hard to be around people I like and like the people I'm around. But do I laugh? Laughing means letting go a little. To laugh you have to not worry what someone will think of you. You don't have time to worry. You just react. You laugh. I know I have laughed at inappropriate times and places. But I can't mine the situation from my memory right now. I laugh at myself a lot. I'm the first to tell you how I screwed something up so you can laugh. Check my Twitter library's Twitter feed if you don't believe me. And yet, I can't remember when I let loose and really laughed. Not giggled, a belly laugh. I want to laugh everyday. I want to be a person who notices funny things and reacts. So, here I go...I'm going to start noticing things and laughing out loud instead of just typing LOL. Feel free to send me something to laugh at!